Was it the 13th today?? Today was the sort of day where you keep checking the calendar to see if it was Friday the 13th. A day filled with challenges. First of all, I see flashing lights on my printer and I’m thinking .. now what?? I check the display and it’s telling me to check the colour print cartridge … oh jesusmaryjoseph!! Not that! Anything but that .. That error message is 99% that your cartridge has given up the ghost and is giving you the huge raspberry of the century! And of course there’s not another one kicking around … I refill my cartridges and don’t keep a spare since I’m not to worried about running out of ink. Of course my next thought is “Aw Crap! I’ve not printed out my border motif yet .. oh BLOODY HELL!!!!”. So I sit and do email, while wondering how to get that motif printed so I can trace it .. It occurs to me, that I can trace it off the screen 😀 So I do a 10px stroke around the lines to make it dark enough to see thru the paper – remember that I’ve not been able to find my scotch tape right?? So I grabbed some athletic tape .. now that we have all over the place .. no shortage of that whatsoever! So I take a small piece and just lightly tack it to my monitor .. the last thing I want to do is have the heat make super goo on my screen .. Oh first I had to get it to the right size so I could trace it .. 7″ on my monitor is not 7″ on paper. Get that all set and traced out .. Oi Vay! Not the best job I’ve ever done, but it’ll suffice as this is more a free flowing motif. 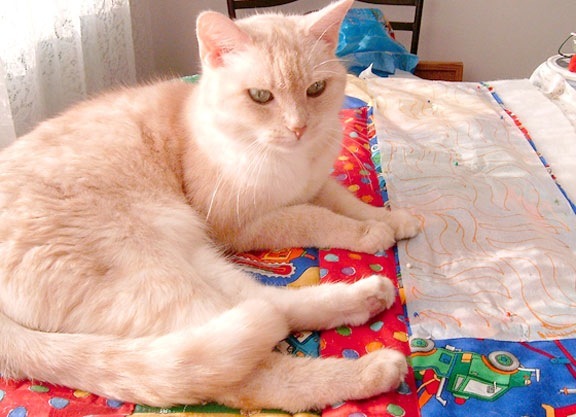 Then comes all the tracing on my tissue paper – no major hardship there .. just tedious – but you do manage to get into a flow with it ..
Off I head to the kitchen, Kyle’s not wiped up his mess off the table AGAIN and the cats are not fixing to budge anytime soon from the sunshine and the quilt. That picture of Pixel is after the umpteenth time that I shooed him off my work .. as you can see, he’s not so inclined to move anytime soon .. you can see why I call him the Brat Prince! He takes being a snoopervisor to a whole new level!! Of course by the time that all’s said and done, it’s time to cook dinner .. **sigh Get that cooked, Reg comes home later than he said, then after dinner, he asks if I’ll go with him for some running around .. Okay .. sure .. he’s leaving on Sunday at 5am or so and I’ve not seen a lot of him lately due to the basketball playoffs and finals .. (BTW – they’re going to OFSSA for the playoffs and championship there in Ottawa – 10 hrs away – he’ll be back Wed some time ) We needed to go to Fabricland and grab some snaps to repair the warmup pants – I said “oh geeze, here we are going into a fabric store and I’m not getting anything :O!? !” LOL .. he asked what I had in mind so I mentioned more batting and variegated thread for top quilting .. sure thing 😀 We get the snaps (Those get fixed tomorrow) Check out the batting .. oh sweet!!! 78″ x 100″ poly for $7.00 (twin sized – perfect for lap quilts) … Now I can live with that .. and it’s a low loft poly too! So we grabbed 2 .. then off to check out the thread .. these sweet babies were only $1.00 each and are 125 yds … I can live with that .. I grabbed the blue for the Big Fan quilt which is on my list really soon! They had some other neat colours, but I wanted to be sure that I had enough of one colour for a quilt .. and I was limited to 5 😉 Since it wasn’t really in the cards to get anything, I wasn’t about to complain. Then after that we did some other running around for some gatorade powder and a cell phone for reg so we could text each other while he’s gone .. That was a huge undertaking .. but we finally found one that he’s happy with and it’s all set up and charged now – We left around 7 or so and didn’t get back home until almost 10. So there went some quality quilt time .. but I wouldn’t have traded it. 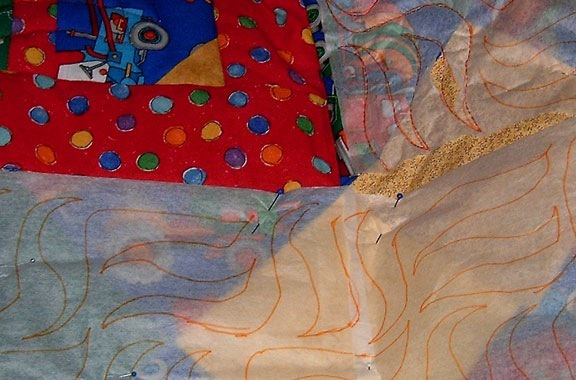 Finally I start quilt around midnite or so, used up all the sheets I had traced, off to trace some more .. I managed to get 2 sides done and am about to start the 3rd, when I realize that I am TIRED! I look at the clock and it’s like almost 3am .. Okay, I’m done .. I’m sure I’ll have a battle of wills with the cats again, but that’s okay .. I’ve some pressing of shirts and pants to do for Reg and we are going to fix the pants too .. Plus fold and make sure he’s all packed and ready to go .. I’ll likely get to quilt on Sunday – but will try to get the border done tomorrow … There’s 2 passes on this border, so I’m doing the inner one first trying to keep the back even and from puckering to badly (which I knew it would), the the outer part of the border .. then I get to find binding, trim the edges and put it on .. I canNOT wait for that at this point! What is the old saying Gracie “If it weren’t for bad luck, I’d no luck at all?” Sheesh, but I give you credit, you keep at it till you get it done! Admirable and inspirational 🙂 My sewing day did not happen today, but I did crochet two new hair nets for Danielle to wear at work 🙂 She hates those crappy things made of nylon, so we started making them crocheted in cotton and worsted–going to start selling them to her co-workers I think! So the moral of my narration is this, I couldn’t quilt because I was trying to cope with sweats and hot flashes, so I crocheted! Like I said, you are an inspiration! Goodness Grace, when do you sleep gal? Not able to stay up that late anymore, so I do it the other way around. Got up at 3:30 to start my Saturday, have blocks to finish for class today with my dgd! Have a good weekend! I dont usualy read messages, but somehow yurs just caught my eye and I was glad I read it. It was amusing I cant say Ive had your problems of course I dont want them I hope they get better soon.